In addition to receiving this latest $5.9 million NIH grant, Columbia University receives a wealth of research funding from outside sources, including the NIH and NSF. Lab suppliers interested in marketing life science products and increasing laboratory sales at New York life science marketing events may be interested in Columbia’s latest funding statistics. In 2012, the NIH awarded Columbia University $364 million in research funding. The funding was distributed to a number of life science departments at the university. Not only did Columbia University receive $364 million from the NIH, but the school received a great deal of research money from the NSF. In 2012, the NSF awarded Columbia University $95 million. The life science project receiving the most funding from the NSF concerned climate change education and received $750,000 in research funding. Given the latest $5.9 million NIH grant and recent NIH and NSF funding statistics, lab suppliers marketing life science products and interested in increasing laboratory sales may want to consider exhibiting at Columbia University life science marketing. 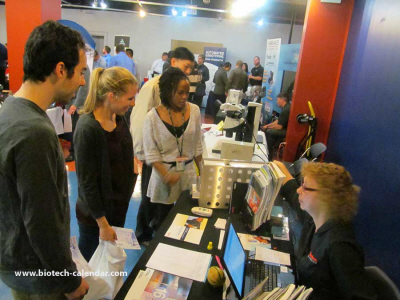 Biotechnology Calendar, Inc. invites all lab suppliers to network with researchers, purchasing agents and lab managers at our Armory Track and Field Center BioResearch Product Faire™ Event, held adjacent from the Columbia University Medical Center, on October 1, 2013. Last year, the Armory Track and Field Center BioResearch Product Faire™ Event attracted 266 attendees. Seventy-two of the attendees were purchasing agents, professors and post docs, and 43 were lab managers. The visitors came from 19 different research buildings and 48 departments across campus. Biotechnology Calendar Inc. is a full-service science research marketing and events-planning company that organizes life science marketing events at top research universities across the country. If you’re interested in marketing your life science products and increasing laboratory sales at life science marketing events closer to home, we encourage you to view our 2013 calendar of events. For more information on our Armory Track and Field Center BioResearch Product Faire™ Event, or to view more detailed funding statistics for Columbia University, click on the button below.